Important Note: Above technical data are theoretical data, it depends on density of the foamed concrete. Generally, lower density, higher pumping height. By adopting double cylinder hydraulic press to deliver concrete, FM-20 is able to meet the need of constructing higher buildings because of its higher pumping ability. 1. Semi-automatic controlling system controls mixing ratio of variety of materials refilling process; also capable of loading materials and refilling water. 3. Stabilized function and performance. 4. Density is easy to adjust. 5. Flexible mobile and positioning ability. IV. 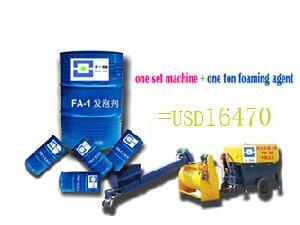 Foamed concrete machine is widely used in roof insulation, for instance, heat preservation and insulation. Its effectiveness is 20-30 times better than a normal material. Therefore, buildings from top to bottom floors have all year comfortable temperature by adopting foamed concrete materials. It is idealized equipment for producing lightweight concrete. Foamed concrete machine has the most advanced technique in this industry which is a combination of hydraulic system, pneumatic system, photo electronic control and quantitative analysis. V. It is desirable for construction. One could operate 3000 to 5000 square meters, with a 120 meters vertical delivery height and 500 meters horizontal delivery distance ability. Density is adjustable between 250 and 1000 kilogram per cubic meter. A variety of flooring materials can be directly paved onto lightweight concrete after solidification. Besides flooring, foam concrete machine can also be used in other related foam concrete products, such as casting, roofing, and blocks.